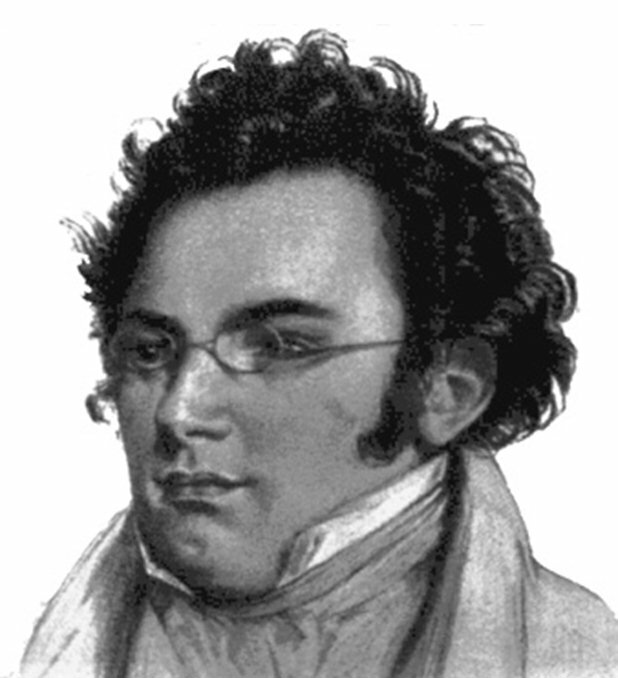 Franz Peter Schubert was born in Vienna on January 31st 1797. His father was a parish schoolmaster and his mother was the daughter of a master locksmith. Of their fifteen children only four survived to adulthood. The Schuberts were enthusiastic amateur musicians. Franz’ father taught him the violin and viola and the family regularly played string quartets on Sundays and school holidays. His two brothers played the violin parts, his father the cello and Franz the viola. From the age of seven he was given piano lessons by Michael Holzer, who by all accounts was an ineffectual teacher. Franz excelled at school and at singing and in 1808 he became a chorister of the Imperial Chapel, with the free provision of board, lodging, and education in the choristers' school, known as the Convict. While there, his musical compositions came to the attention of Antonio Salieri, the Viennese court composer, who decided to train him in musical composition and music theory. When he left the convict at the age of seventeen, he had already completed more than a hundred musical works. His first job was in his father’s school, but his heart was not in teaching. He would set his class work to do while he sat at the front desk composing music and only looking up to glare and anyone who made a noise. He endured life as a teacher for just over two years during which his reputation as a composer of songs grew, particularly with the composition of Erlkönig. He began to receive sponsorship and to publish sufficient songs to support himself as a full time composer. The fourth symphony, dated April 1816, was written towards the end of his spell as a teacher. It was first performed by an amateur orchestra, which had grown out of the family string quartet. Like most of Schubert’s major masterpieces it was neglected in his lifetime - all the Viennese public wanted to hear was his songs. The first public performance took place in Leipzig on November 19, 1849 in a memorial concert marking the twenty first the anniversary of his death. The full orchestral score was not published until 1884. Schubert himself gave the fourth symphony the name “tragic”. Possibly he did this in an unsuccessful attempt to attract the attention of publishers or impresarios. The work is not overtly tragic in nature. Both the outer movements start the minor mode and are tempestuous and dramatic in character, but each ends triumphantly in the major key. Overall the form and scale of the symphony follow the models of Mozart and Haydn, but there is considerable innovation and originality in the harmonic ideas and tonality of the work. This is immediately apparent in the slow introduction to the first movement which begins in the key of C minor, but just 10 bars later has arrived in the totally unrelated key of G flat major. Schubert manages the shift of key in a smooth and natural way. The allegro vivace that follows is in sonata form, and again effortlessly explores distant tonal areas, finishing unusually in major mode. The slow movement is based on two contrasting ideas. The first is a hymn like melody, which recurs three times in the home key A flat major. The three occurrences are punctuated by the agitated dramatic second theme first in F minor, then in Bb minor. The minuet and trio movement is in the style of Haydn, but with bold Schubertian harmonic movements, and an un-danceable allegro vivace tempo suggesting some influence of Beethoven. In the finale, Schubert returns to the dramatic mood of the first movement. One of the movement's most striking features is the constant eighth-note figure in the second violins and lower strings, which gives the piece a propulsive energy. In another very original stroke, Schubert moves to the major key for the movement’s recapitulation. He ends forcefully and energetically without a coda. Schubert's Tragic Symphony was performed by the Portobello Orchestra on the 24th March 2007. The conductor was Anthony Weeden.